Chronic headaches and migraines are a common problem that affect many people and cause much unnecessary pain and discomfort. The severity of pain can range from mild and intermittent to episodes of debilitating, throbbing, unrelenting agony, as well as nausea. There are a few different types of headaches, therefore a single person can suffer from multiple kinds of headaches throughout their life. The World Health Organization estimates that around 70% of males and 80% of females in developed countries suffer from tension type headaches alone. The WHO's studies also show that 1 out of every 20 people suffer from headaches daily or every other day. Chronic headaches are not only annoying and painful, but they can also predispose a person to other health complications. For example, research shows that depression is 3 times more common in people who suffer from chronic headaches than headache free individuals. 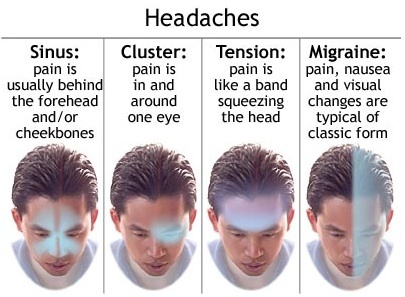 There are many types of headaches, and identifying what type you are suffering from can be a big step in the direction of relief and avoidance of headaches. Migraine: There are a number of certain criteria that you must experience for a headache to be classified as a migraine. 1) Must last 4--72 hours 2) Characterized as pulsating, and it is unilateral and/or worsened by physical activity 3) Experience nausea or sensitivity to light or sound (Photophobia or Phonophobia) 4) See an "aura" or flashing lights before your headache starts and 5) Possible impairment of vision. If you want a more comprehensive list of symptoms for migraine Click Here. Tension: This is the most common type and is related to improper posture and stress levels. Some common symptoms are 1) Effect both sides of the head 2) Usually located in the front or around the sides of the skull like a "tight band" around your head 3) Occur later in the day after stress or being in a position for extended period of time. Sinus: This type of headache is associated with a sinus infection or congestion. Usually caused by inflammation or pressure from mucous in the sinus cavities of the skull. People feel pain usually behind the front of the face adjacent to the nose or in their forehead. Relief comes from a variety of means including: herbs, over-the-counter medications, prescription drugs, rest, and ice/heat packs on the forehead or neck to name a few. While treatment is important, it is also important to consider what is causing the headaches in the first place. Considering natural alternatives or a preventative lifestyle to halt the headache before it starts is a better way to live life headache free. A recent study looked at 91 migraine suffers who were given three different treatments for their headaches: Topomax (prescription medicine), relaxation techniques, and 40 mins of excercise 3 times per week. At the end of the study there was no statistical difference between the groups, meaning all subjects had the same amount of relief. Wouldn't it make sense to choose relaxation or excercise therapies, which benefit your body in many ways beyond headache relief, instead of taking a drug that has potential side effects such as diarrhea, fatigue, and nausea? There are other factors that have been shown to trigger headaches as well. Some of the reported common sources of headaches and migraines are: flourescent lighting, coffee, alcohol, hypoglycemia (low blood sugar), high blood pressure, vitamin B or D deficiency, dehydration, oral contraceptives, some prescription medications, food allergies or intolerances to food additives such as MSG, sugar, preservatives or food coloring. Some ways to prevent your body from reaching these states or from being exposed to these substances is to be proactive with your diet and lifestyle. Try focusing on what might be linked to your specific headache. If it occurs after eating certain foods, maybe it's related to that food, or if it happens after being at the office all day, it could be the lighting, dehydration, or eye strain from the computer monitor. Keep a journal documenting when the headaches are occuring, and you may be able to help diagnose the cause yourself. Keep healthy snacks with you throughout the day to keep your blood sugar levels stable. Also its important to eat protein and good fats with meals to help with maintaining your blood sugar. Avoid improper posture especially when seated at a desk or are in another stationary position all day. Check out the information about posture and preventative stretching in the Upper/Mid Back section on our Back Pain page. Stay hydrated and keep a good water source with you druing the day especially if your active. Check out Water Information to see more about the amount of water to drink and what sources are the best for you. Avoid processed or packaged foods high in preservatives or foods high in MSG or sugar. This means avoiding most fast food resturaunts and keeping prepackaged frozen meals are off your grocery list. Eat food with good amounts of magnesium like garlic, seafood, kale, broccoli, spinach, melon, bananas, basil, cantaloupe, blackstrap molasses, and some nuts. Magnesium is shown to help stablize blood vessels, which is important to prevent migraine and cluster type headaches specifically. Try eating foods high in tryptophan such as turkey, black-eyed peas, walnuts, almonds, sesame and pumpkin seeds, and brown rice. Tryptophan found in these foods converts to serotonin, which is shown to help prevent migraines as well. A commonly forgot source of 70% of the body's serotonin comes from the intestinal tract. So eating a healthy diet in general will improve your serotonin levels, which will make you feel good and prevent headaches. See our Dietary Guidelines page for more detailed information about healthy eating. If your migraines are related to B vitamin issues then you want to consume foods high in riboflavin such as broccoli, eggs, almonds, raw milk, and organ meats. You can also take natural B vitamin supplements from quality companies like Standard Process, Biotics, or Thorne to name a few. Avoid smoking and alcohol use or from being around others that are using those products if they aggrevate your symptoms. If you want to be very effective at preventing headaches just moniter when your headaches occur and keep a food and/or exposure diary to help you narrow down what the exact cause could be. This will make it easy to pinpoint the problem. Recent studies have shown that patients suffering from chronic headaches and migraines may benefit more from chiropractic care than drug therapy alone. According to the American Chiropractic Association close to 15% of all people who visit a chiropractor do so to seek relief for pain from chronic headaches or migraines. For cervicogenic headaches that originate between the upper shoulders and lower skull area, chiropractic treatment such as spinal manipulation, has been shown to be quite effective at reducing symptoms and preventing future headaches. A 2001 Duke University study found that spinal manipulation provided relief for patients with headaches that originate in the neck, and resulted in fewer side effects than medication. When you get trigger points (tight knots in your muscle) in the upper shoulders and neck they can cause the sensation of pain in the head that mimic headache pain. This type of pain is called "referred pain" and is a very common cause of headaches, especially for people with posture problems or that sit at a desk for long periods of time. Trigger point release therapy and correcting muscular imbalance and dysfunction can not only relieve the pain, but can also help stop these types of headaches from occuring in general. Another possible solution if you suffering from a headache pain is to apply pressure to a point on each hand between the thumb and index finger, right in the center of the web of skin (see picture above). Applying deep pressure to this area with an instrument or your fingers has been known to release endorphins (natural pain-control chemicals) and cause some relief of the pain in your head and neck. A commonly over looked cause of headache pain is a disorder of the temporomandibular joint (TMJ). 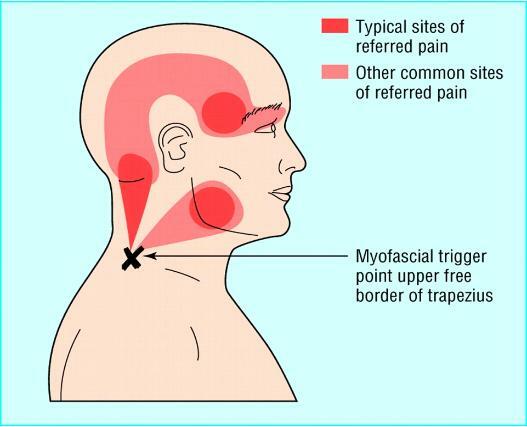 When there is imbalance in muscles controlling the jaw, trigger points can develop, which can lead to migraine and tension type headaches. TMJ disorders can result from many processes: past trauma to the face or jaw, increased mental/emotional stress, or dental work that results in teeth not coming together correctly while biting or chewing. 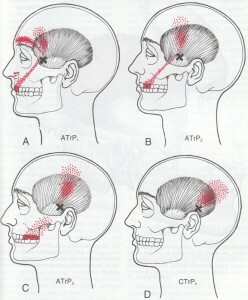 The picture above shows common pain referral patterns from teeth to areas of the head. At Synergy Chiropractic we specialize in treating the muscles of the TMJ via manual therapy as well as other modalities. If you have any questions please Contact Us or view Our Services page for more information. The two main herbs used for headache prevention are Feverfew and Butterbur extract. Both have been shown to be quite effective at preventing headaches or reducing the number of headaches a person has. The only down fall to the herbs listed is they do not stop a headache once it has begun they only work at preventing future ones from beginning. You can find both herbs at local apothecaries in tinctures, capsule, and other forms. If your headaches are causing nausea you can consume around 1 gram of ginger, preferably the raw or pickled ginger form. You can also drink peppermint tea or chew raw tea leaves as well. Another option is the well known homeopathic used for nausea called Nux vomica. Go to your local apothecary or health store to seek out these options. Another option for headache and nausea relief is consuming a tea made from cayenne pepper, ginger, and peppermint. To make the herbal tea, mix the three herbs together by placing a pinch of cayenne pepper, a one inch piece of fresh ginger and a teaspoonful of dried peppermint in two cups boiling water and allow to steep for 15 minutes. Remove the herbs and sweeten with honey to your liking or don't use any at all. Natural pain relievers in each of these herbs can work together synergistically to help ease away your migraine headache. Snow V. Weiss, K. Wall, EM, Mottur-Pilson C., for the American Academy of Family Physicians and the American College of Physicians-American Society of Internal Medicine. Pharmacologic management of acute attacks of migraine and prevention of migraine headache. Ann Intern Med. 2002;137:840-849. 2.Ramadan NM, Silberstein SD, Freitag FG, Gilbert TT, Frishberg BM, and the US Headache Consortium. Evidence based guidelines for migraine headache in the primary care setting: pharmacological management for prevention of migraine. American Academy of Neurology. US Headache Consortium. 2000: 1-55. 3. Tfelt-Hansen P. Prophylactic pharmacotherapy of migraine: some practical guidelines.Neurol Clin. 1997;15:153165. Miles, Otesa. "Migraine Statistics an Introduction." Migraine.com. Health Union, Nov. 2011. Web. 07 May 2012. <http://migraine.com/migraine-statistics/>.